Valley of the Moon wines honor an important 75-year era when Italian proprietors Enrico Domenici and Henry Parducci grew grapes and made wines at the winery they called Valley of the Moon. We continue to produce Valley of the Moon Pinot Blanc Chardonnay, Pinot Noir, Zinfandel, Cabernet Sauvignon and Blend 41 from some of Sonoma County's best vineyards. 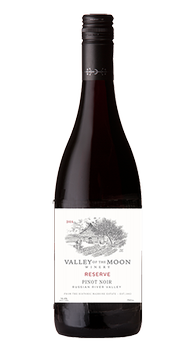 Valley of the Moon wines are available nationally in restaurants and in wine stores. This reserve pinot noir offers a myriad of fruit-forward flavors showcasing notes of blackberry jam, alpine strawberry, and plum with hints of allspice. Caramelized brown sugar, blackberries, bay leaves and tobacco complements a supple tannin structure and long finish.